Ed Orgeron pounded his chest and pumped his fist as the assembled crowds on either side of the campus street whipped into a frenzy. It always starts with the Tiger Walk, the coach often remarks of LSU’s pregame stroll down Victory Hill, and you could feel the electricity in the Louisiana air several hours before the big game kicked off. The local boy had his Tigers a surprising 7-1 and appeared to have mighty Alabama right where he wanted them: coming into Tiger Stadium on a Saturday night with SEC West supremacy hanging in the balance. Two years ago, speaking at his first SEC Media Days as LSU’s head coach, Orgeron spoke of looking forward to the day when LSU would beat Alabama again. Last year, after a semi-encouraging 24-10 loss in Tuscaloosa, Orgeron made his famous declaration that the gap was narrowing. “We’re coming,” the coach growled in the bowels of Bryant-Denny Stadium last November. “And we ain’t backing down.” LSU echoed those sentiments in the run-up to LSU-Bama 2018 with a hype video that went viral. Alabama came into the game looking as dominant as ever, but the Crimson Tide hadn’t played anyone, creating some sense of optimism that a battle-tested LSU team bolstered by a hostile crowd could add up to an upset special. Orgeron chirped Monday that Alabama would have to deal with some stress for the first time thanks to his hard-nosed defense and the aura of Death Valley. And led by Steve Ensminger and Joe Burrow — his two key offseason moves — things would be different on offense, too. Instead everything was so painfully the same in what amounted to ice bucket bath of the cold, hard truth. LSU got shut out in Tiger Stadium again as Alabama dragged the formerly-brash bunch up and down the field all night in a 29-0 beatdown. LSU now hasn’t scored against Alabama at home since 2014 and has failed to score more than 17 points against the Tide in eight of their last nine meetings. The year and the rankings may have been different, but the story was the same: Alabama absolutely manhandled LSU in the trenches on both sides of the ball. Alabama sacked Burrow five times and flushed him from the pocket on several other occasions. LSU had negative yards rushing in the first half and finished with a grand total of 12. The Tigers averaged 3.3 yards per play compared to 7.3 for Alabama. LSU flip-flopped between Austin Deculus and Adrian Magee at right tackle throughout as Alabama defenders toasted them off the edge. Left tackle Saahdiq Charles wasn’t much better. Nobody could block nose tackle Quinnen Williams, who finished with 10 tackles and 2.5 sacks. Orgeron felt the game came down to personnel and execution, plain and simple. He recalled plays where Ensminger dialed up a max protection and slid the line only to see Alabama rushers beat their blockers clean. “They dominated us the whole night,” Orgeron said. 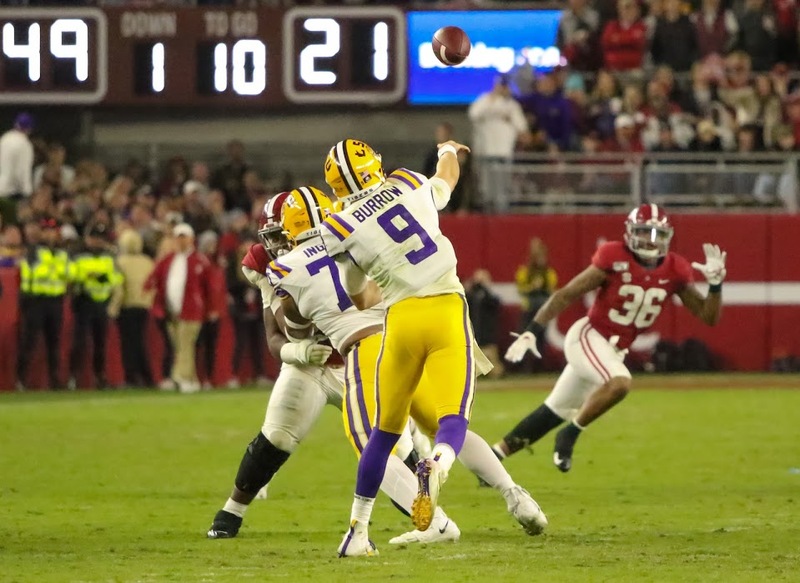 LSU’s defense fought valiantly, especially without Devin White in the first half, but the relentlessness of Alabama and the woefulness of their own offense eventually wore down their will. Alabama finished with 281 yards on the ground, and when LSU did manage to get near Tua Tagovailoa, he’d just dodge the rush and make the play anyway. Setting aside the two weeks of intense hype and delusional optimism, this overachieving LSU team was clearly overmatched by what may go down as Nick Saban’s best team ever. There’s a reason the odds makers in Las Vegas installed LSU as a two-touchdown home underdog for the first time since 1999. Now at 7-2 with three winnable games remaining, LSU has a chance to finish strong and potentially land in a New Year’s Six bowl if Orgeron can keep his team from splintering. By any metric, that would be a successful season for a team predicted to struggle for seven wins. But as for the ultimate goal of chasing down Alabama and turning the one-sided series back into a real rivalry, well, Saturday’s beatdown illustrated how much more work Orgeron and his staff have in front of them. It’ll be another year before LSU gets another shot at Alabama on the field, but the results are going to be the same until they star outflanking Saban and Co. on the recruiting trail. The tug-of-war for five-star defensive tackle Ishmael Sopsher of Amite comes to mind, among others. LSU’s 2019 haul is thought to have the makings of a transformative class, but how much of an impact can one class make? Or two? Or three? Alabama has seemingly lapped the field in recruiting the trenches for a decade straight, and that can’t be undone overnight. This game shouldn’t be any kind of referendum of what Orgeron is building at LSU. Whatever team stands between that juggernaut and the national championship will probably get rolled in similar fashion, but it was a hard reminder that it’s Alabama’s world, and everybody else is just living in it. LSU still may be coming under Orgeron, but the demoralizing events of Saturday night are proof that they’ve got a long, long way to go.